Since August 2017, a massive exodus of over 706,000 Rohingya people have fled violence in Myanmar by crossing the border into Bangladesh. The Rohingya people are one of the most persecuted minority groups in the world. 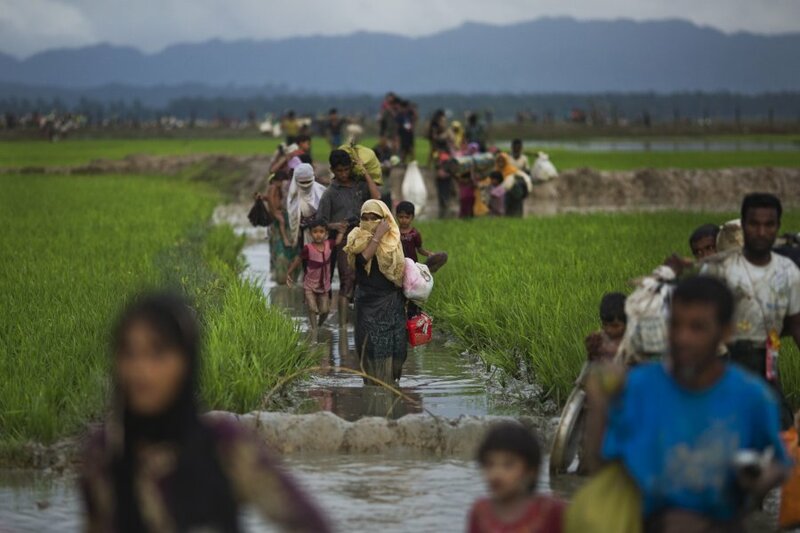 Following a concerted campaign of extreme violence by the Myanmar authorities against Rohingya people in Myanmar’s Rakhine state in August 2017, nearly 700,000 Rohingya fled over the border into the Cox's Bazar district of Bangladesh. Surveys conducted by Doctors Without Borders/Médecins Sans Frontières (MSF) in the refugee camps found that at least 6,700 Rohingya were killed by violent means in Myanmar between 25 of August and 24 of September 2017. At least 730 were children under five years of age. Living conditions in the refugee camps in Cox's Bazar, Bangladesh are dire. Many people lack access to clean water, sanitation, health care and shelter. Outbreaks of multiple vaccine-preventable diseases are springing up among the population. MSF remains present on the ground in Cox's Bazar, delivering urgently needed medical care and working to prevent the spread of disease, as we continue to respond to one of the world's most difficult humanitarian crises. Since August 2017, when over 700,000 Rohingya were forced to flee from Myanmar into Bangladesh , the denial of their legal status, coupled with unacceptable living conditions in haphazard makeshift camps, continues to trap refugees in a cycle of suffering and poor health. In July 2018, MSF Canada executive director Joe Belliveau visited Cox's Bazar, Bangladesh, to see first-hand MSF's response to the Rohingya refugee crisis. Belliveau had himself previously managed MSF's field operations in both Bangladesh and Myanmar, so it was a return to a context he was familiar with and an opportunity to reassess the role of crisis response as part of MSF's humanitarian medical action. In the Summer 2018 issue of Dispatches, the MSF Canada magazine, Belliveau shares some of his experiences, alongside those of Jonathan Skillen, a Canadian from Barrie, Ontario, currently working as medical team leader at MSF's Balukhali clinic for Rohingya refugees in Cox's Bazar, and Susan Phillips, a Canadian nurse working at MSF's Kutupalong clinic. In June, as Canada played host to a gathering of G7 leaders at a summit in Quebec, MSF Canada executive director Joe Belliveau published an op-ed in the Ottawa Citizen calling on Canada to use its leadership to spur international action in response to the ongoing Rohingya refugee crisis on the border between Bangladesh and Myanmar. "It is essential that Canada demonstrate leadership and use this opportunity to obtain not just vague statements but real commitment from some of the world’s most influential states to a consolidated and resolute international response to the Rohingya crisis. The status quo – perpetual statelessness – is not an option. And humanitarian aid cannot substitute for a political solution. The only way forward is for the G7 and other states to recognize and fight for the Rohingyas’ shared humanity, the fact that they belong somewhere – and to take concrete steps to make it possible for Rohingya children born today to have the chance for a real and viable future." A new report from MSF summarizes in detail the testimony of Rohingya patients in Bangladesh who fled ethnic violence in Myanmar. In the early hours of August 25, 2017, the Myanmar military launched “clearance operations” in Rakhine State, ostensibly in response to coordinated attacks by Rohingya armed groups on Border Guard Police outposts. This resulted in an estimated 688,000 mainly Rohingya people from Rakhine State fleeing into neighbouring Bangladesh. The speed and scale of displacement resulted in a critical humanitarian emergency; together with previously displaced people, this took the total number of Rohingya in Bangladesh to more than 900,000. In November 2017, MSF conducted a total of six health surveys in Cox’s Bazar district which aimed at quantifying the current scale of the emergency by assessing factors including levels of mortality over time. Findings show that the Rohingya have been targeted, and are the clearest indication yet of the widespread violence that started on August 25. 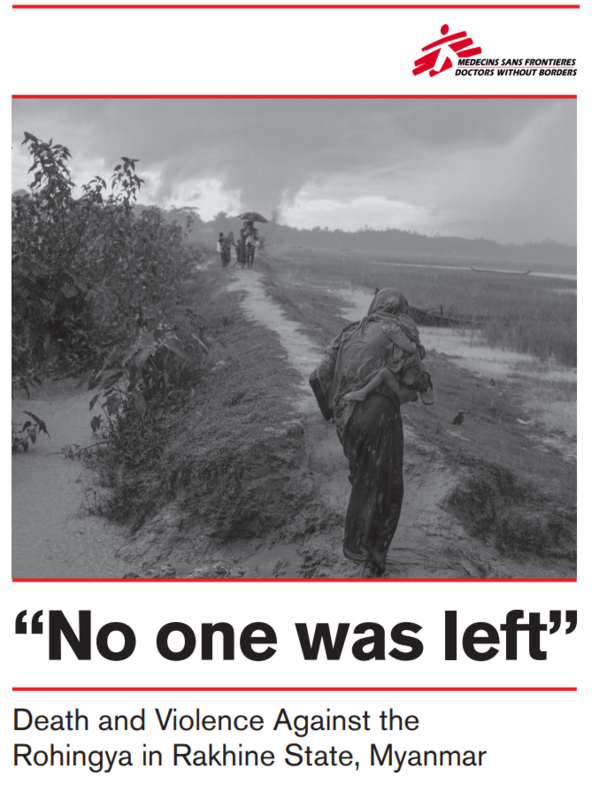 Now, MSF has released a report, "No One Was Left": Death and Violence Against the Rohingya in Rakhine State, Myanmar, summarizing the health survey results and painting a picture of the violence that led to the Rohingya refugee crisis still taking place in Bangladesh. Read more about the findings of MSF's medical surveys in the report "No One Was Left"
Kate Nolan is MSF's emergency coordinator in Bangladesh. She describes the challenges that remain on the border with Myanmar since violence in that country began driving hundreds of thousands of refugees in search of safety across the border. "The thing I find most striking about this situation is its magnitude – the sheer number of people who have crossed the border in a short space of time, barely six months. In fact, people continue to arrive today." "The refugees end up in densely crowded and overpopulated makeshift settlements in the Southern district of Cox’s Bazar. Their shelters are mostly made of plastic and bamboo, packed closely together, and with inadequate water and sanitation conditions. As we see through our medical consultations in all the settlements, the Rohingya were already marginalised and excluded in Myanmar. They had very little or no access to healthcare and were not routinely vaccinated against communicable diseases, so their immunization coverage is very low. Our medics treat many people with diarrhea and respiratory tract infections – diseases related to the living conditions in the camps. We see wounds that have developed into serious infections after not being properly treated, and chronic diseases that have never been properly addressed." "All these factors combined: the sheer size of the population, the densely crowded conditions, the inadequate shelter, and the apparently very low level of immunisation, create a perfect storm for the public health situation. I am concerned about fresh emergencies evolving within the current emergency. For example, the upcoming rainy season with the monsoon and tropical storms, in an area that is prone to heavy cyclones, presents an obvious greater potential for waterborne diseases such as acute watery diarrhea." Humaira is a 25-year-old Rohingya refugee from Maungdaw district in Rakhine state. She arrived in Bangladesh in October 2017, after the violence reached her hometown. In late January 2018, she was found in a state of shock by an MSF outreach team in the Jamtoli makeshift settlement and brought to the Doctors Without Borders/Médecins Sans Frontières (MSF) primary healthcare centre there, where she is being treated. "When the violence broke out, my husband was taken by the Myanmar military. I don’t know whether he is dead or alive. They took us from our homes, burned them to the ground and beat us very badly. When we fled, I was already heavily pregnant. I left with my son and another woman, but lost contact with her during the journey. I couldn’t take any belongings with me. We walked for several days through the forest. We were starving and only survived by eating the leaves of the trees. We slept in the bush. We finally reached the riverside and boarded a boat that would take us to Bangladesh." Surveys conducted by Doctors Without Borders/Médecins Sans Frontières (MSF) in refugee settlement camps in Bangladesh estimate that at least 9,000 Rohingya died in Myanmar, in Rakhine State, between August 25 and September 24. As 71.7% of the reported deaths were caused by violence, at least 6,700 Rohingya, in the most conservative estimations, are estimated to have been killed, including at least 730 children below the age of 5 years. The findings of MSF’s surveys show that the Rohingya have been targeted, and are the clearest indication yet of the widespread violence that started on August 25 when the Myanmar military, police and local militias launched the latest "clearance operations" in Rakhine in response to attacks by the Arakan Rohingya Salvation Army. Since then, more than 688,000 Rohingya have fled from Myanmar into Bangladesh. October 26, 2017 — Doctors Without Borders/Médecins Sans Frontières (MSF) International President Dr. Joanne Liu, a physician from Montreal, recently visited Cox’s Bazar, Bangladesh, where a refugee crisis is unfolding after renewed violence in Rakhine State, Myanmar. On October 23, she spoke at a Pledging Conference for the Rohingya Refugee Crisis organized by UN agencies, and called for more organizations to prevent what she called a "public-health time-bomb." "There are almost no services available and the vulnerability of people’s living conditions is shocking," she says. "Whole families are living under plastic sheeting in muddy and flood-prone terrain. They have very few belongings, are vulnerable to attacks from elephants, and have no access to clean water, latrines, food or healthcare. "It’s a very fresh displacement and people are in survival mode, which you can clearly see in everybody’s body language. People are taking each day as it comes, trying to secure the basics to get through the day. Currently the humanitarian response is quite scattered: plastic sheeting is handed out in one location, while bags of rice or water are distributed elsewhere." Help us provide life-saving medical humanitarian relief. Donate online or call +1 800 982 7903 [Toll free].